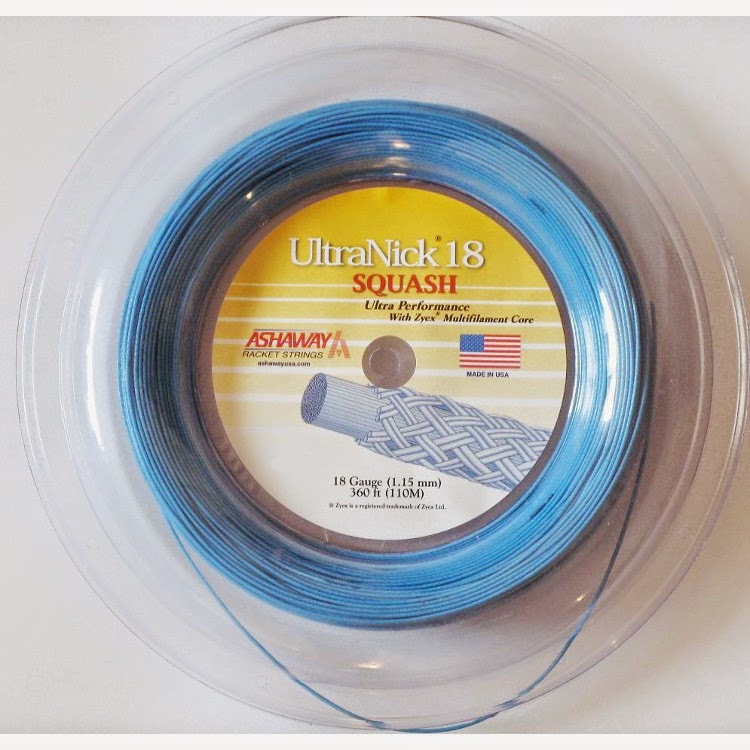 Today I am going to talk about squash string. I am constantly asked what type of string someone should play with and what tension they should string their racquet at. For any serious squash player I always recommend experimenting with all the different types until you find one that has the best feel and power combined. For a serious competitive squash player, durability is secondary to these other characteristics. Generally speaking the lower the tension the more power but less feel. The strings become like a trampoline and the ball explodes off the racquet. Of course if you string your racquet too loose your strings will move around a lot and this seems to really bother some people. How much does a strong out of place really affect your next shot? Properly negligible at best. 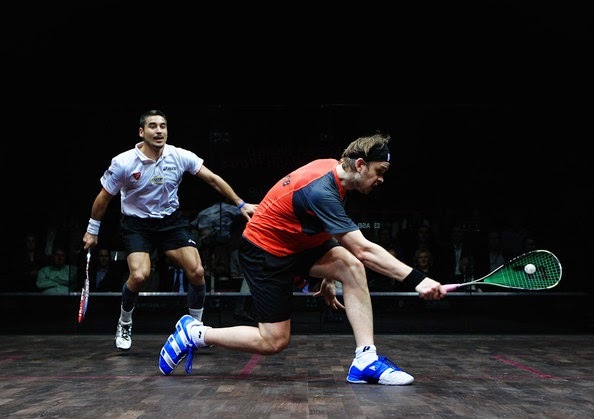 An average squash tension is 27-28 pounds. I normally don't go more than 1 or 2 pounds higher or lower from this range, but it does make a big difference. 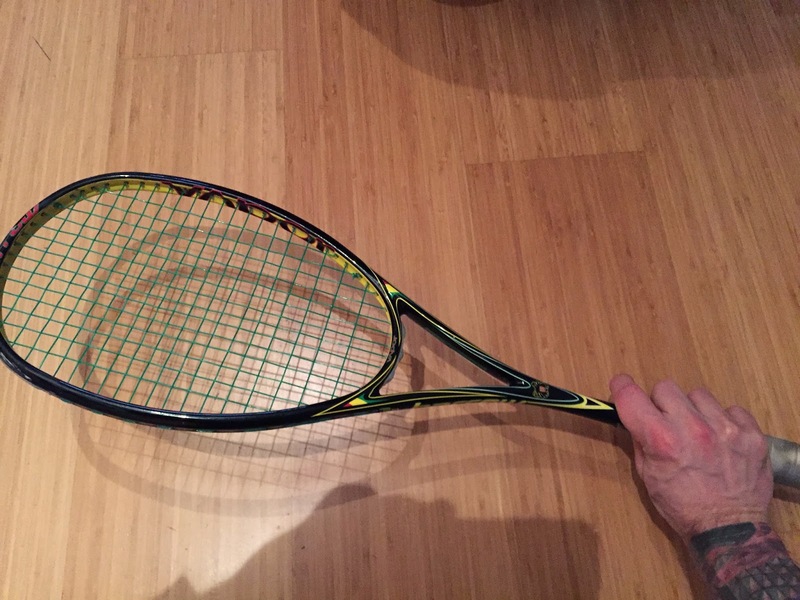 Another important thing to know about string tension is that factory strung racquets normally come strung quite high. The racquets normally have a 'ping' sound to them and I usually cut out the factory string. But I have the luxury of having my own stringing machine so it doesn't cost too much money. A racquet strung too high is dangerous for people that don't have proper and efficient swing biomechanics. If you have any elbow or shoulder issues you shouldn't get your racquet string too high. I would recommend 27 at the highest, or better yet some lessons to correct your stroke! It's important to remember that string loosens up as you play with it. If you're a hard hitter or you don't break strings very often you may want to get the racquet strung a pound or 2 higher as it will slowly become your ideal tension. 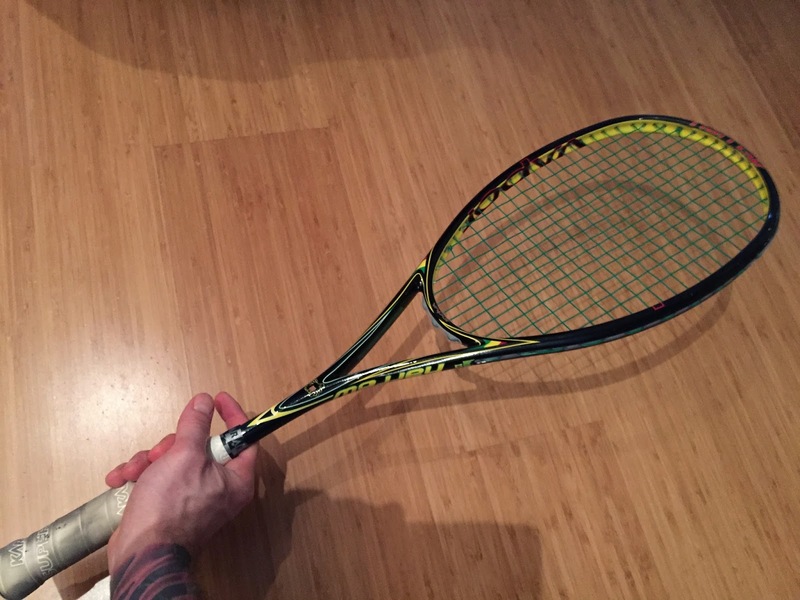 Another important factor about string tension is the size of the racquet head. Mostly this has to do with the length of the main strings. The longer the main strings, for example on an open throat racquet I string the racquet a little higher. Whereas the old school, small head squash racquets had a small radius and could be strung at a lower tension, but would feel much tighter. Depending on the length of your main strings and also the number of them, you should increase or lower the tension accordingly. If you only have 12 main strings on anon throated racquet you are probably better stringing your racquet closer to 29 or 30 pounds. Unless of course you have a history of tennis elbow. Different strings have different structural qualities and because of this they should also be strung at slightly different tensions. 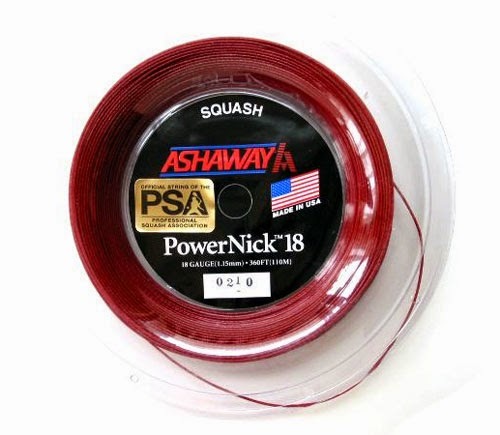 Ashaway Powernick 18 for example recommends striking their string 10% lower than other strings. 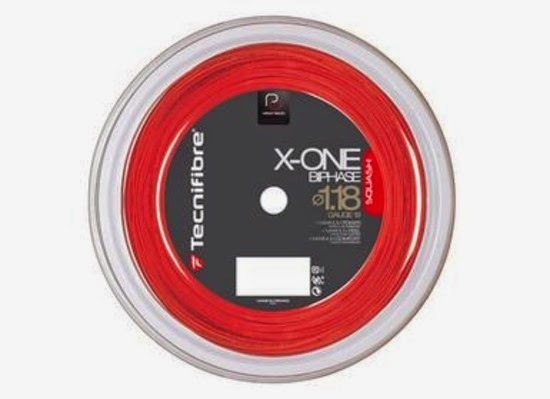 Meanwhile Tecnifibre recommends stretching their string before stringing it, so again you don't have to string the racquet quite as tight as a racquet that didn't have a pre-stretched string. Hardball doubles racquets are normally strung quite a bit higher. I don't get to play much doubles anymore, but when I did I would string my racquet at 40 pounds or even slightly higher. The ball is much harder than a softball and you will have too little control and your strings will move all over the place if you use a racquet string at 27 pounds. You will also find that you break a lot more strings playing with a hardball. 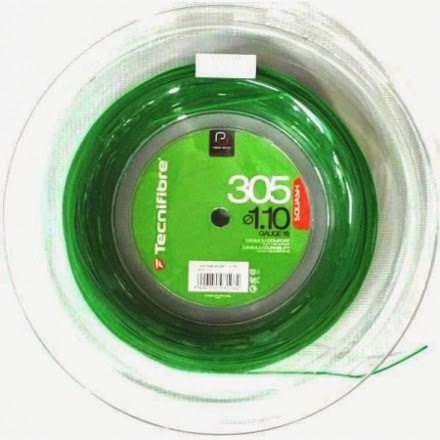 The main characteristics you are looking for in a squash string depend on your level, your style of play and the cost of the string. Most average club players could use any string and not notice much of a difference. For these players you want durability. For more advanced players who notice the difference in feel with their strings will be looking for a more advanced product. There are many on the market and I will cover the most popular ones now. This string has been around since I was a little kid. It's a good basic string. I find it has average durability and power with a low amount of feel. I recommend this string to any average club player who doesn't care much for the feel and wants to have a basic cheap set of strings. This string is a step above most cheap factory string, but I don't see many advanced players using it these days. There is also the Supernick Titanium which lasts sightly longer, but again has a low amount of feel. This is one of the more popular choices I see at the club. This string is one of the best for overall durability, feel and power. It costs a little more than the basic Supernick, but is well worth the investment. This string is similar the the above Powernick 18. It's the same gauge and made of the same material, but I would say has slightly more feel or touch. Some kids also just prefer blue string! 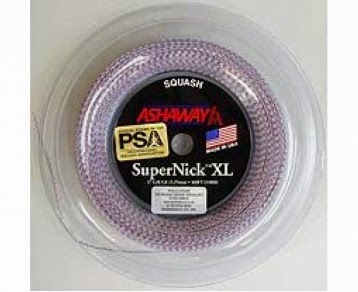 This string is not very popular from what I see in Canada, but I like this the best of all the Ashaway strings. It has a little more texture and feel to the string. The string is slightly thicker, but it doesn't really last any longer because of the texture. If you like to slice the ball and already use Powernick 18 or Ultranick 18, give this one a try. This string has the most power of any Technifibre string. 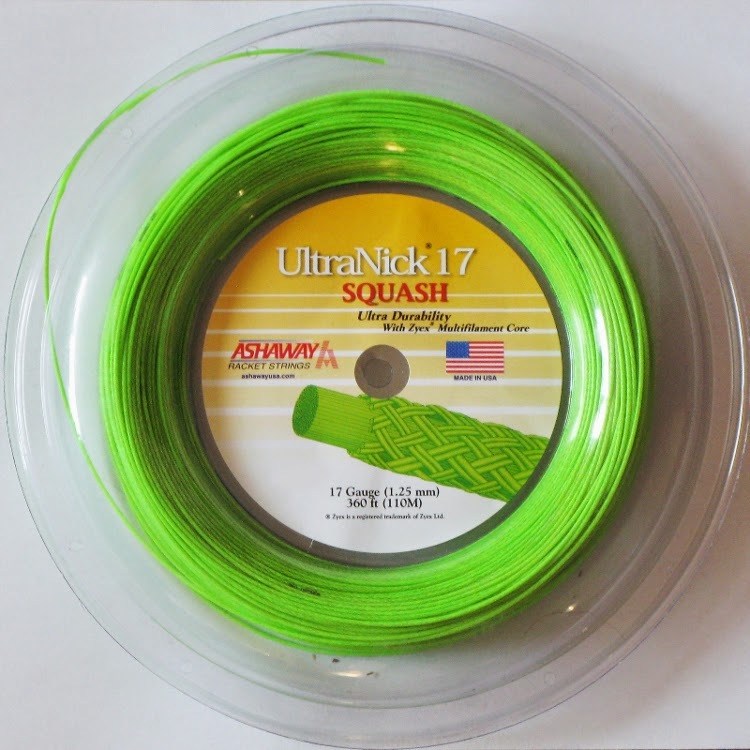 Because this string still has the same multifilament as the other classic green string it still has good feel to it. The durability is average, but pretty good for a Tecnifibre string. If you are looking for more power and don't want to loose your feel, give this one a try! This string is another top of the line choice. It doesn't have quite as much power with as the X-One, but has slightly more feel. This is a great choice for someone that likes to slice the ball. This string is the same as the one above, but is a thinner gauge. This is my string of choice. Because it is thinner, it is actually slightly lighter and I feel it has more tough. The only issue with this string is that is has poor durability. On average I break 1 set of strings per week, but I also have the luxury of owning a stringing machine. I only recommend this to 3 types of people. Those who have multiple racquets, as you need at least 3 to go to a tournament with. Those that have their own stringing machine (as it will get expensive). And finally those that are highly competitive and play at advanced level as you will notice the difference (because it's just the best!). 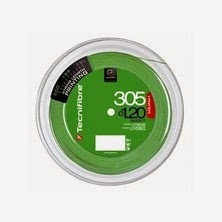 I know Tecnifibre has the 305+. I've only tried it once and I didn't care for it much. I haven't had enough experience with it to give a more thorough review. I know there are lots of other companies that make string. There are probably even some very good products out there that I have never even heard of, but I cannot review them because I'm unfamiliar with the. If you want to ensure you are playing with a high quality string, try out an Ashaway or Tecnifibre model. I'm always interested in hearing what types of string people like to use? Do you have another make or model that you really like? I'm always looks for suggestions. I'm not sponsored by any companies so there is no conflict of interest in any of my reviews. Also, if you are a squash family and go through a lot of strings, you may want to invest in a squash stringer. My dad did when I was about 10 years old and I've strung well over a thousand racquets an still use the same stringer to this day. You can always start with a cheap tabletop stringer which should only cost a few hundred dollars. These tabletop string machines do the trick, but if you're doing a lot of stringing you'll eventually want something more study. If you do this, just makes you you don't start undercutting your squash club's string service. That's part of the way squash clubs and coaches make a living. Play around with the types of string and the tension. You may just find something that suits your game better. If you're not sure what you're looking for, ask yourself what characteristics are you looking for in a string? Durability, power, control/feel, or just the colour? Today I'm going to talk about exercise or resistance bands. There are many types of bands and just as many various ways to use them. I just ordered 2 sets of them today so I won't have any feedback on the quality of them until they arrive and I get to play around with them for a bit. 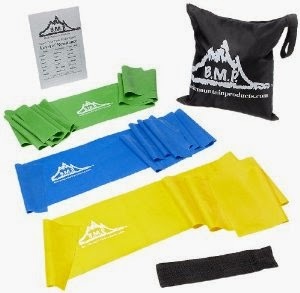 The first one I ordered was a set of 3 from Black Mountain Therapy Exercise Bands (seen below). They have 3 different resistances/elasticity strength to them which will come in handy working with a large age range of kids. I always see pitchers in the MLB use these bands to warmup in the bullpen before they start throwing. So you could also keep one of them in your bag and use them as part of your warm up routine. 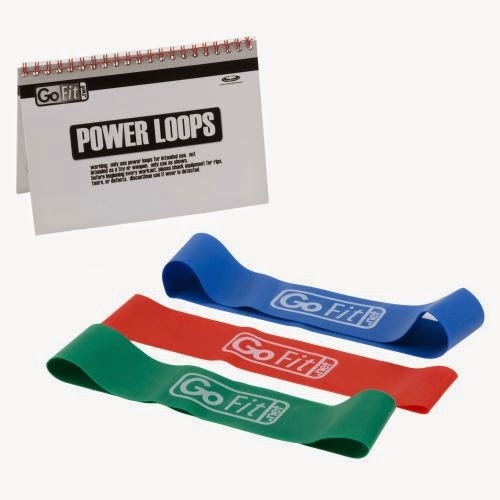 The second set of bands I ordered are loops (pictured below). These bands are like giant elastic bands and are used for different exercises. I used these once at the Pacific Sport Institute here in Victoria and I liked them. We used them more for warming up and getting hidden muscles (like the hip flexors) to fire. What I like so much about resistance bands is that you can reproduce squash specific motions. So you can work on technique along with moderate strength training. They are also extremely portable and you can use them at home or the office. Just a few minutes every second or third day and you'll feel the difference. I do have just 2 concerns about this type of product. The first is if a band snaps or isn't fastened currently. Even though it seems like a harmless training tool, it requires proper precautions to ensure it's safe. I know some people pull or hold the resistance bands for one another as they do the exercises. This could be dangerous to do with kids as it can easily slip, so I won't use them this way. If you want to be extra cautious I recommend using this with your eye guards on. I know it may look silly at the office or at your house, but if a band does snap or come loose the last place you want to get hit is in the eye! Ok, have I scared you off them yet? Hopefully not, because I do believe these will be a great addition to the coaching tool box and can do a lot of good. The second concern I have with resistance bands is the potential for muscle or joint strains. If someone is unfamiliar with the bands and overdoes it they are susceptible to a mild injury. Like every new exercise you begin you have to slowly build up your muscle endurance and the receptions. The good thing with ordering a set of variable textile strengths is that you can start with most elastic one and build your way up to the most resistance. Make sure you tie the resistance band to something sturdy and be sure it's a good knot or two! These bands also come in handy during rehabilitation from a number of injuries. I've used them before when rehabbing a sprained ankle to increase the range of motion. You can also use them to stretch after your match. There's so much you can do. Pick one up online (I got mine at Amazon) or at a place like Sport Chek. Do you use resistance bands or have you tried them before? Did you use them for squash specific movements? Last thing..how are your resolutions coming along? Have you set or updated your goals for 2015? What are you going to do differently? A small subtle change adds up over time. Maybe it's adding a few reps with an exercise band to your weekly training that will get you that extra snap on your backhand! Today I'm going to talk about the challenges of getting a court in the New Year. Everyone has great intentions and new resolutions for the New Year and with this comes busy athletic and squash courts. What can you do to make sure you can get on court. There are quite a few ways you can maximize you court time and make sure you get on court as much as you want. - arrive early. At least 20 minutes before your court time is best. - warm up before going on court. - have a practice plan. Are you going to do drills, condition games or play a match? What area of your game do you want to work on? - time or score your drills and condition games so you don't end up doing a warm up drill for half of your court time. - keep you water breaks short. Most people gab and take 3 or 4 minutes. If you only have 40 or 45 minutes of court time make the best of it! - book your court as far in advanced as possible. Many clubs have a 1 week advanced booking so don't wait until a day or two before to book or you probably won't get a court. - don't hold up the next people going on. If they are by the court and ready to go on, don't play that extra rally or two or wait for them to knock on the glass. - cancel any court you aren't going to use and do so asap. - if you are going to solo hit do it during off peak hours. - only book 1 court time during peak hours. - try and find an off-peak time to play during the week or on the weekend. - don't get upset about the busy courts. This means your club is doing well and making ends meat. - you can also do more off-court training during this period time. If you have a mini home gym or if you enjoy running or cycling outside you don't have to worry about the busy gyms. 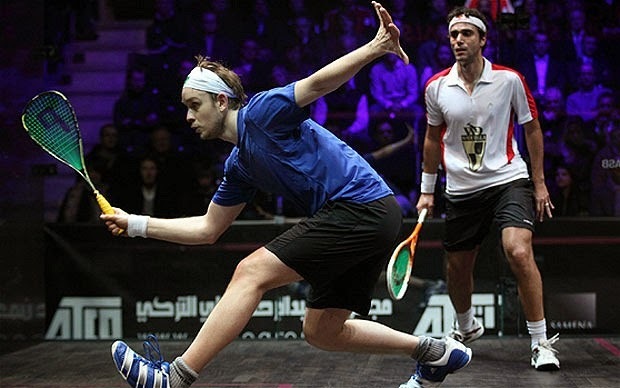 - you can also attempt book a lesson with your squash professional. They will be busy too, but can often book a court further ahead than the members can! - try and get a group together so you can have 3 or 4 people per court. You can also try and join some group clinics or drop ins which maximize court usage. Basically you have to be more prepared and able to adjust to the increase court demand. Don't expect to have the same luxuries you do during the rest of the calendar year. You can still get enough court time if you plan ahead and are efficient with how you spend your time on court. 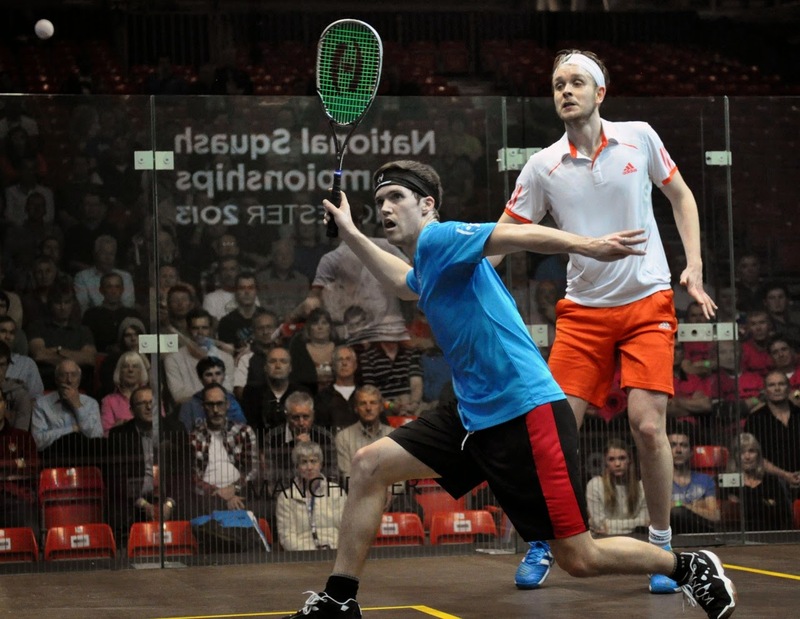 I'd just like to finish off by thanking everyone who has taken the time to give me feedback on Serious Squash. I've had a number of positive comments from people all over the planet. I'd also like to thank everyone that voted in the poll. The majority of you want more articles on tactics, so I'll keep that in mind moving forward. I hope all of you had a great holidays and are ready to have a big second half of the squash season!